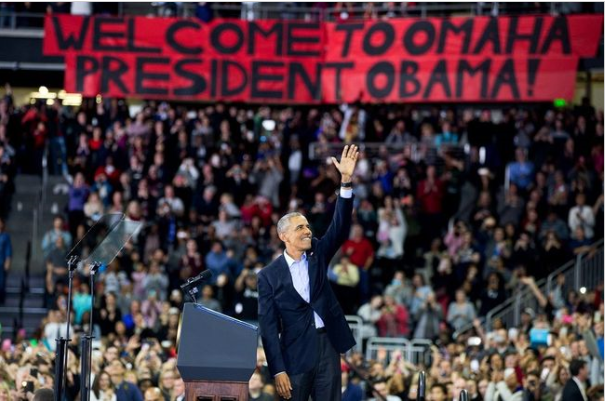 I have no antagonism for Barack Obama. He was elected because of the unpopularity of the Iraq War and George Bush who started it. He inherited the Financial Crisis and pulled us out of it without another depression. He has put us on the road to universal healthcare even though the structure of the Affordable Care Act does little to control costs. Stagnant Economy. The annual rate of growth of GDP since the end of the Great Recession in June 2009 has been an anemic 2% compared to our historical growth rate of 3% since the end of WWII. Although the official unemployment rate is down to a respectable 5%, there are millions of unemployed and underemployed people who have stopped looking for work. Obama and the Democrats in Congress have little interest in the tax reform and deregulatory measures which would boost economic growth. Massive Debt. 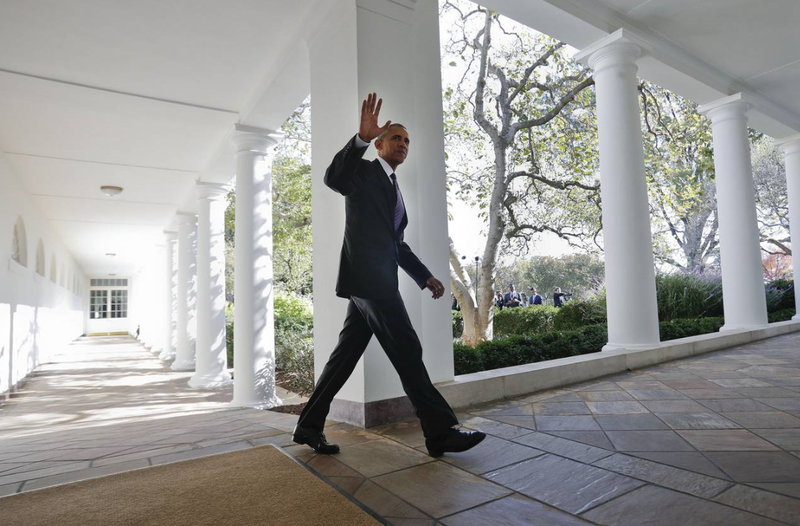 Our public debt (on which we pay interest) has doubled to over $13 trillion on Obama’s watch. As the Federal Reserve begins to raise interest rates to ward off inflation, interest payments on this debt will increase enormously. 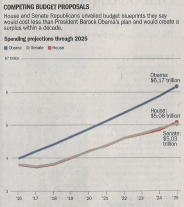 It is absolutely imperative to begin to substantially shrink our annual budget deficits. The Democratic Party, under his leadership, has expressed no willingness to do this. Chaotic Middle East. The rise of ISIS in Syria, Iraq and North Africa, and the resulting refugee crisis in Europe is the result of weak U.S. leadership in the Middle East. Peace and stability depends on a strong U.S. presence in all trouble spots around the world. We neglect this responsibility at our peril. Hyper-partisan Political Atmosphere. Stalemate in addressing these and other serious problems has led to the rise of extremist presidential candidates like Bernie Sanders and Donald Trump. Moderate candidates with successful experience in elected office are unable to gain political traction. Our country is in a big mess. We are being guided by ideology rather than common sense. I am optimistic by nature. But it’s awfully easy to be pessimistic about our future. The Supreme Court will soon render an opinion in King v. Burwell challenging the implementation of the Affordable Care Act. If the Court agrees with the plaintiffs, then anyone receiving health insurance through one of the federal exchanges operating in 33 states is not eligible to receive a subsidy. Several Committees in the House of Representatives are proposing to take such an opportunity to make improvements to the ACA. 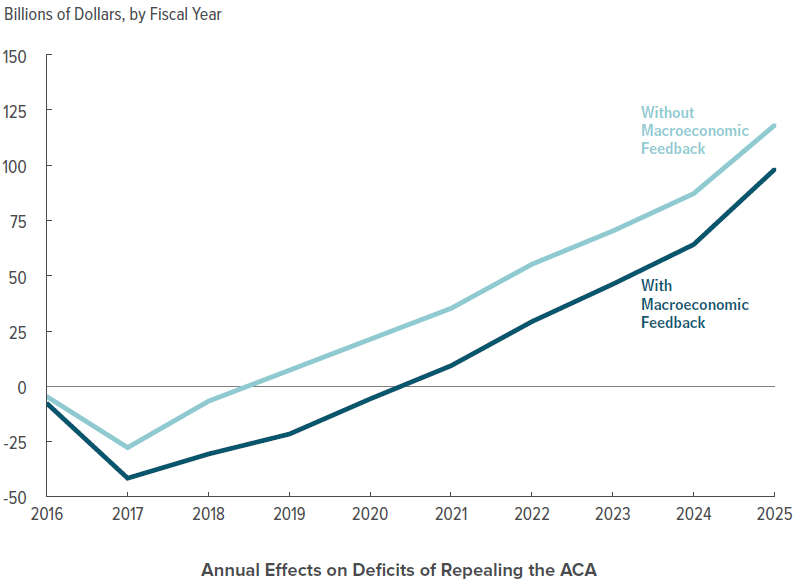 In addition, the Congressional Budget Office has just released a report on the “Budgetary and Economic Effects of Repealing the Affordable Care Act,” indicating that repeal of the ACA would add $137 to the deficit over 10 years. This is because the loss of ACA imposed new tax revenues and spending cuts to Medicare would exceed the amount of money spent to expand insurance coverage. Replace all of the ACA mandates and tax subsidies with a universal (and refundable) tax credit which is the same for everyone. This is the fairest way to subsidize healthcare for all and it also removes the huge market distortion provided by employer provided health insurance which is tax exempt. The tax credit would be about $2500 per individual and $8000 for a family of four, the approximate cost of catastrophic health insurance and also the average cost of Medicaid. Replace all of the different types of medical savings accounts with a Roth Health Savings Account (after-tax deposits and tax-free withdrawals). Keep the ACA exchanges which would be required to provide change-of-health status insurance for the protection of the chronically ill.
Changes such as these would dramatically lower the cost of American healthcare by making all of us directly responsible for the cost of our own healthcare. They would also virtually eliminate the perverse market effects of the ACA which encourage companies to cut back on numbers and working hours of employees. This in turn would speed up the growth of our stagnant economy! Does ‘Middle Class Economics’ Really Work? 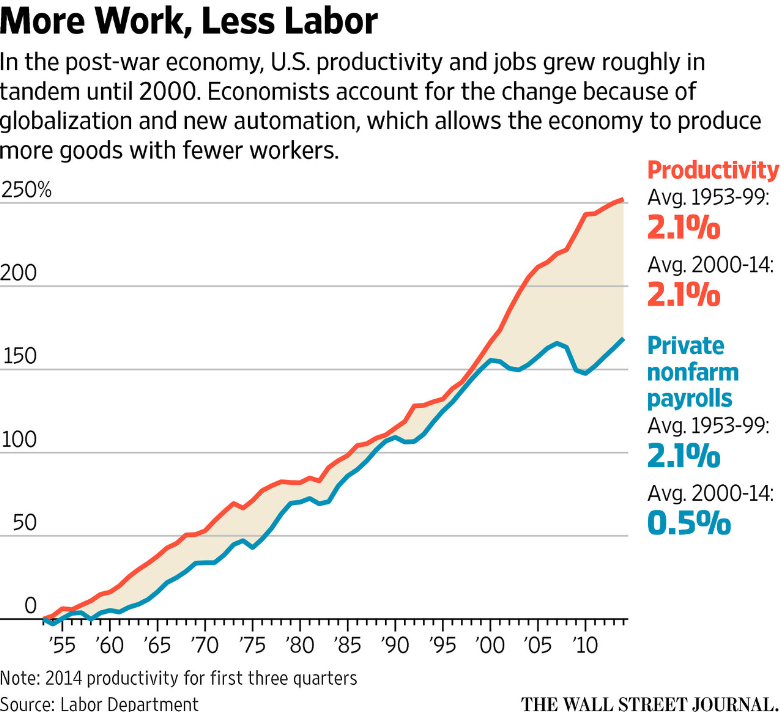 The above chart shows the divergence between productivity growth and payrolls beginning in the year 2000. It is a vivid portrayal of the “hollowing out” of the middle class which is causing so much grief. Tax and regulatory provisions such as tax credits for childcare, college tuition and a second earner in households where both parents work. Employers would be required to provide paid sick leave and the minimum wage would be raised. Make workers more productive by expanding access to community college. Increase overall economic growth with increased infrastructure spending and new trade agreements. The problem, as Mr. Barro points out, is that such policies would have only a small effect on the taxes of a middle-income family, amounting to a cut of no more than $150 per year on average. This is much less than the average family will save from falling gasoline prices. By the Federal Reserve holding down interest rates, or at least letting them increase only very slowly. With policies to make it easier to work less. The Affordable Care Act does this by decoupling health insurance from full time work. The surge in disability insurance recipients takes people out of the labor market. The rapid retirement of baby-boomers does the same thing. Unfortunately there are many negative effects from both the Federal Reserve’s easy money policy as well as a shrinking labor participation rate. I will return to this issue soon! Is the Democratic Party Giving Up On Growth? Prospects for future economic growth are decidedly grim. The Congressional Budget Office has just reported that after a brief improvement for a couple of years, annual GDP growth will likely hover around 2.2% for the remainder of the ten year window 2015 – 2025. This means, in turn, that the unemployment rate will also not likely fall much below its current level of 5.7% for the same ten year period. A new report from the McKinsey Global Institute makes the even gloomier prediction that average U.S. GDP growth rate for the next 50 years will be only 1.9% per year, given current trends and policies. A summary of this report is provided by the Brookings Institution social economist, William Galston. Mr. Cohn points out that both President Obama as well as Hillary Clinton have endorsed such ideas. Initiatives such as these are unlikely to go far in the current Republican Congress but they may still sound very attractive to the many hard-pressed middle class families with stagnant incomes. Implement broad-based tax reform with lower tax rates for all, paid for by closing loopholes and limiting deductions. Reduce regulatory burdens on business by, for example, streamlining (not repealing!) the Affordable Care Act and the Dodd-Frank Financial Reform Act. Expand legal immigration with additional high-skill visas as well as an adequate guest worker program. Expand international trade with new trade agreements. These are all political footballs, of course, but also policies with much potential to speed up economic growth. Either we take initiatives such as these or we consign our country to a future of relative economic stagnation with slow wage growth, high unemployment and increasing income inequality.